The first act of “Mr. Burns” chronicles the immediate aftermath of a nuclear apocalypse and features a group of survivors sitting around and talking through a well-known episode of “The Simpsons.” The second act, seven years later, depicts that same group of survivors, now performing in a ragtag theatre troupe, collecting and performing beloved episodes of “The Simpsons” for a paying audience. The third act takes place 75 years later still, in a future culture in which “The Simpsons” has transformed into mythic allegory of epic proportions. The play runs Feb. 20-24 in Muhlenberg’s Studio Theatre, Trexler Pavilion for Theatre & Dance. The first two acts of “Mr. Burns” examines the role of community in the aftermath of a crisis — exploring how people react, how they come together and talk to each other when their entire cultural context has been razed to the ground. The third act in particular raises the social position of pop culture to grand heights, highlighting the way in which the stories we tell depend on the environment in which we live. In this act, 82 years after the nuclear meltdown, that old “Simpsons” episode from around the campfire has been elevated to high culture — a “Simpsons” operetta, stuffed with the bits and bobs of turn-of-the-millennium American life. Constructing society involves more than just performance. Costume designer Matthew Ryan Limerick says that a lot of his work had to do with conceptualizing how people would rebuild industry in the aftermath of disaster. “In designing the costumes for the third act, I’d tell one of my friends the name of some obscure Simpsons character and ask them to describe the character to me,” Limerick says. “That’s how I’d get my design. It’s about how we’ll remember these characters when we don’t have the internet, or books about ‘The Simpsons’ lying around to reference. “We’ve gotten to this point where clothing has become temporary and limited. But what happens when we don’t have the machines to mass produce anymore?” he says. Through music and dance, “Mr. Burns”’ third act takes us through some unifying cultural highlights while critiquing culture-destroying systems. The score, written by late composer Michael Friedman (“Bloody Bloody Andrew Jackson”), combines modern pop music, classical church pieces, and some of Gilbert & Sullivan’s greatest hits. Ed Bara musical directs and Sammy Reyes choreographs. The cast of “Mr. Burns” has spent much rehearsal time living in that dark, post-apocalyptic space. Reit says the third-act pop music lightens everyone up enough that they’re able to work through the difficulties together. “Mr. 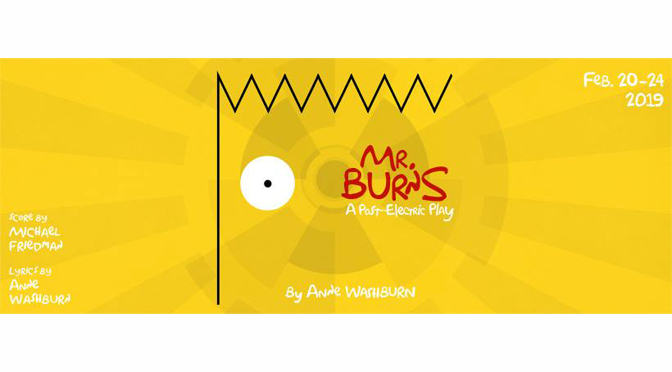 Burns, a Post-Electric Play” Feb. 20-24. Showtimes are Wednesday through Saturday at 8 p.m., Saturday and Sunday at 2 p.m. Regular admission tickets are $15. Tickets for youth and LVAIC students and staff are $8.